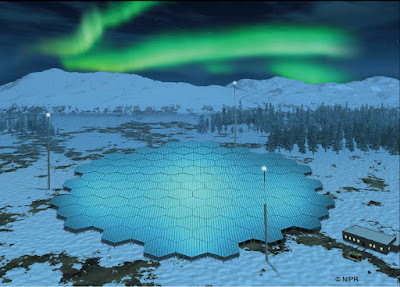 A new international research radar called EISCAT_3D was given the green light to proceed this month, promising a step-change in understanding the effect of solar storms and space weather on the upper atmosphere in the Arctic, including the magnificent Northern Lights. At a total cost of 685 million Swedish crowns, the EISCAT_3D facility will be distributed across three sites in Northern Scandinavia - in Skibotn, Norway, near Kiruna in Sweden, and near Kaaresuvanto in Finland. Each site will consist of about 10.000 antennas fed by a powerful 5 MW transmitter at Skibotn and a receiver at each of the three sites. The EISCAT_3D project will start in September 2017 with site preparations to begin in summer 2018. The radar is expected to be operational in 2021.
antenna groups of 91 individual antennae each. The diameter of the whole installation is about 70 metre. EISCAT_3D will be the world’s leading facility of its kind, offering a critically important window to the upper atmosphere and the near-Earth space in the European Arctic. The system will be built by the EISCAT Scientific Association, primarily comprising research councils and national institutes from Finland, Norway, Sweden, the United Kingdom, Japan and China, with additional members from several other countries. EISCAT_3D is the culmination of a 10-year design and preparation phase, supported by the European Union. The selected design is a sophisticated phased-array radar which brings together new capabilities never before combined in a single instrument. As the name suggests, a key capability is to measure a 3-D volume of the upper atmosphere, in unprecedented detail. This is necessary to understand how energetic particles and electrical currents from space affect both the upper and the lower atmosphere (e.g. space weather and auroral phenomena) as well as man-made technologies such as satellites and power grids on the ground. Today, on 30th September 2014, the preparatory phase project "EISCAT_3D – Europe's Next-Generation Radar for Atmospheric and Geospace Science" ends after four years. The project was funded by the European Commission under the Framework 7 programme. The results of the project are summarised in a set of Milestones and Deliverables, which are publicly available on the project web site. The EISCAT Scientific Association will now continue the work towards securing funding for EISCAT_3D, and negotiations with interested parties are on-going. Given that funding is in place, EISCAT_3D will enter the implementation phase, the main tasks of which are to work with the relevant industries towards manufacturing of components, to acquire land and obtain permissions for construction, and to finalise the frequency allocation. With the end of the current project, also this blog, which has been an independent community effort, is coming to an end, and the Twitter and Facebook feeds will not be updated anymore. We thank all our readers for their interest and all contributors for their input. Please follow future updates on EISCAT and EISCAT_3D related developments on the respective web sites www.eiscat.se and www.eiscat3d.se, or indeed come and join us at the next EISCAT_3D User Meeting, which will take place in Uppsala, Sweden, 6th to 7th May 2015. At the end of the EISCAT_3D End-Of-Project meeting, there was time for a bit of fun. 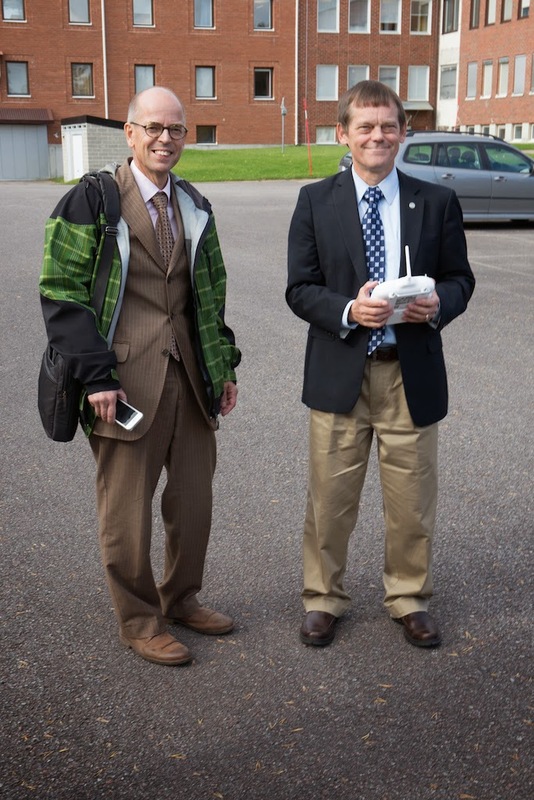 EISCAT Director Craig Heinselman demonstrated his drone to us. 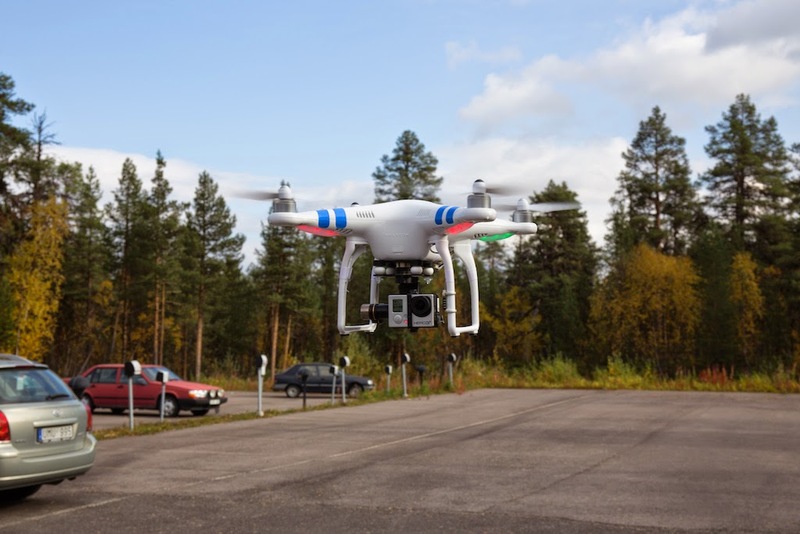 The photo above is taken by the drone, hovering behind yours truly. You can watch a short clip of the film footage on Craig's gallery site. 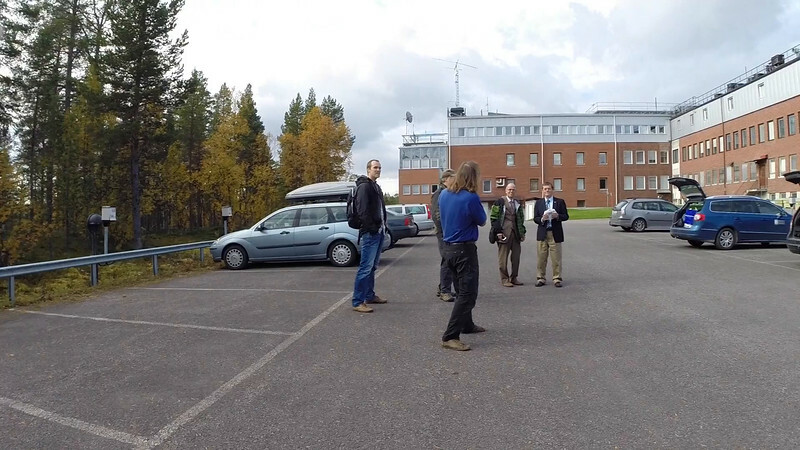 The drone took a picture of me, just while I took a picture of Craig flying the drone (right) and Esa Turunen (left), who was the Director of EISCAT before Craig. Then Craig told me to turn around and made me aware of the drone behind me, and I took this final photo. You can watch the whole sequence from the drone's point of view by clicking on the link to the video above. Photos: Craig Heinselman and Thomas Ulich. 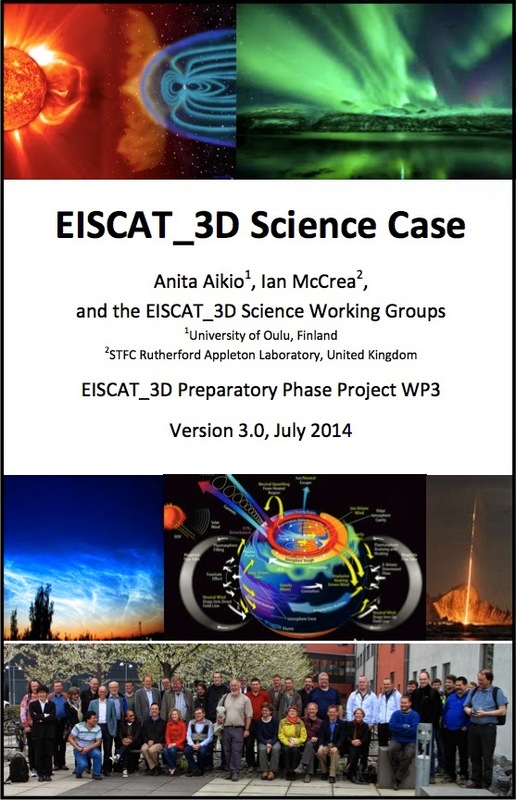 The final version of the EISCAT_3D Science Case document (Deliverable 3.6) is now available on the EISCAT_3D web site. The document is the result of four years of work of Work Package 3 of the FP7 EISCAT_3D Preparatory Phase project. Several expert teams on various topics new to the classic incoherent scatter ionospheric work of EISCAT have been convened. The result is a document detailing the exciting science topics to be tackled by the EISCAT_3D radar, which will be the first true vector-volumetric radar of its kind. 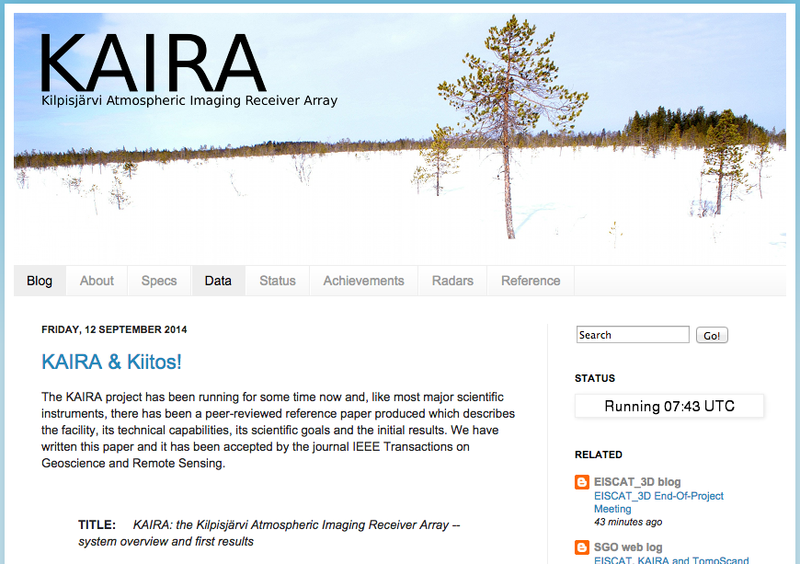 Our colleagues of the Sodankylä Geophysical Observatory (SGO) built the Kilpisjärvi Atmospheric Imaging Receiver Array (KAIRA) in 2011 in support of the EISCAT_3D Preparatory Phase project. Already before the actual construction began, the colleagues involved in KAIRA began to blog about their efforts. During the most active times of construction, they published up to three articles per day on their blog. The KAIRA blog also provide a unique insight in a scientists daily life, with reports from various locations, travel to meetings, and quirky events. Now, on Friday, 12th September 2014, the last blog post was published on KAIRA marking the publication of the so-called KAIRA Technical Paper describing the facility. The KAIRA blog will remain in place, but it won't be updated anymore. At the same time, our SGO colleagues started a new blog about SGO activities in general, and future news on KAIRA will be published there. The End-Of-Project meeting is coming to an end, we heard presentations from all work packages, had a lot of interesting discussions. We had 27 participants coming from Sweden, Finland, Norway, Japan, and the UK. The EISCAT_3D Preparatory Phase Project, funded within the EC Framework 7 programme, is coming to an end. The project began in October 2010 and will end at the end of September 2014. Currently there's the so-called "end-of-project" meeting underway in Kiruna, Sweden, hosted by EISCAT Headquarters. During the project, the results of all 14 work packages are presented to the project participants. The meeting then concludes with a public presentation of the project, its results, and future outlook. These are reported in a large set of Deliverables, which are publicly available on the EISCAT_3D website. Needless to say, "end-of-project" refers to the current preparatory phase project only, the EISCAT_3D endeavour as a whole of course continues! Photo of Kiruna Space Campus by Mikko Orispää (@morispaa).